How was your month? We still had mostly horrible weather, but did have a few good days. Oddly, the warmer it got outside, the colder I felt inside — I think winter got into my bones this time! And in spite of having to spend a lot of time the last couple weeks out in the goat pen, I did manage to make 90 blocks this month, so that helped me get caught up. There are little goat babies everywhere! But when I managed to find sewing time, here’s some of what I worked on . . . I made this block from my Summertime Sampler pattern. I’m doing another version all scrappy, and I’m loving it. I also made 4 other filler blocks for this third version of my quilt. I made another Improv Herringbone block. I’m leader/endering these, and surprisingly, getting more done on it than I thought I would! I still need a lot more blocks to make my quilt as large as I want, tho. These are my two versions of the Virginia’s Puzzle quilt, the free quilt-along that’s going on over at The Life of Hazel Ilene right now. It’s not too late to get in on it if you want — we just got rolling good. Go check it out, if you haven’t already. So that was my month! How about you? Did you get lots of sewing time and make some blocks? It’s time to report in with your March totals. Just leave a comment below, or contact me. I think I have the Project Page all updated. Our new block goal for April is 22. A smaller number this time, cos if you’re like me, and the weather is turning nice, you’re gonna wanna be outside more! This makes our year-to-date total 87. And the prize winner for February is Clara! Clara is right on track with 66 blocks so far! I’m wishing us all a wonderful April. (I can’t believe it’s April already!) I hope you get all the sewing time you want! 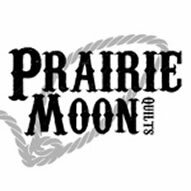 Later this month, I’ll be in Paducah at the AQS show. I’m excited! It’ll be my first bit of travel this year, since I’ve been sticking really close to home for a few months. I don’t mean to be stupid. 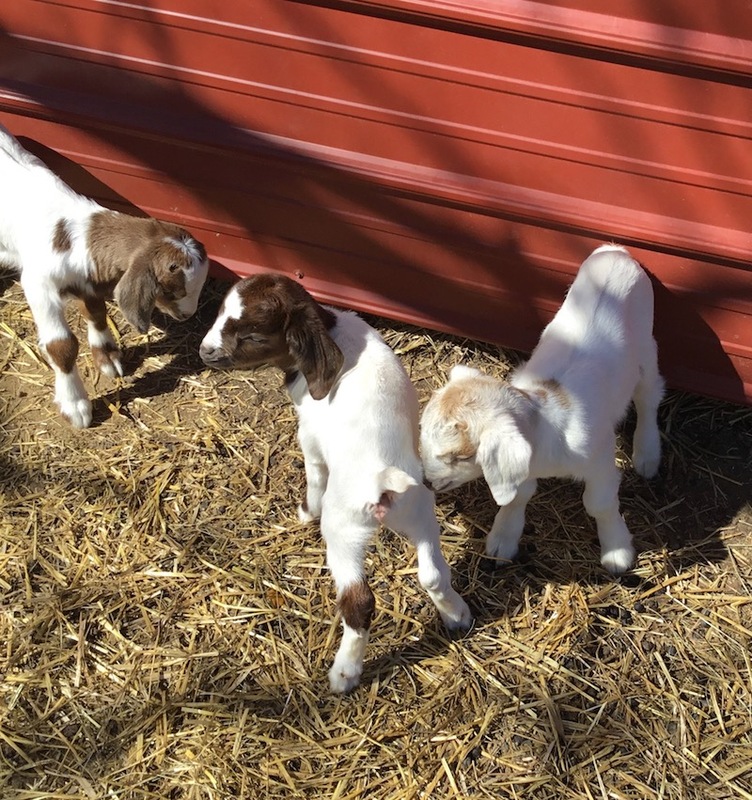 This question will show I did not grow up on a farm….. What do you do with goats? They are so stinkin’ cute! So, I get that piece. Thanks for the insight. I have 173 blocks this month. It sure feels like I have been busier! You have really been busy in and outside the house! We had snow again yesterday but it didn’t stick…still not a welcome sight! Enjoy Paducah! I made 2 blocks. Each block has HSTs, totaling 100 blocks per big block. I got 153 made because I only count when I finish a project and I finished a few this month. Yea! I made 51 blocks this month. I have finished 39 blocks with month. 3 were small blocks that made 2 coasters and 1 pin cushion, plus many of the blocks for a I Spy twin size quilt. I must get to quilting some finished tops. Yippee! I got some blocks made…not a lot but I’m claiming them. I made 26 blocks this month thanks to attending a weekend retreat. Most were 3 in bow tie blocks that started as a leader ended. I made 6 blocks this month. Hopefully April will be a little more productive. I am behind in some sal/ slow stitch, will have to make it up in April…. all I managed this month was 33 Trinket blocks…4 1/2 inch foundation paper pieced. I did not make any blocks this month, but I did a lot of hand quilting and knitting. No blocks were made this month. I am in the middle of quilting a wedding quilt. I should be done with it but I broke a couple of needles and it scared me. I think my ruler foot was not placed properly and thus I broke a few needles. Then I had my oldest daughter’s AIT graduation to go to in Missouri and then prep for my youngest daughter’s return home from Japan after being gone for almost two years. I have been on an emotional roller coaster. Well I did not do as well as last month, but I did go back to work after being off for 3 weeks. I did get 386 blocks done, so I am proud of that. I did get a chance to catch up on some blocks that I was behind on and a couple of more quilts done, as in putting on the boarders, did not know how to count the boarders so I have not been doing so. Hope everyone has a great April and we all can sew sew sew. I made an outstanding number of blocks this month…. THREE! Mine must have been one that wasn’t updated. From the email I sent had 26 in January (that’s on the list), 57 in February and 12 only for March giving me a total of 95 as of end of March. We had goats on Grandma’s farm. We went from three – mama had twin girls to 6 as the first three all had twins. It was crazy fun. Make that 9 goats – hehe. Forgot to count the Grandma goat and the two moms. Suprise to me! 87 blocks….the best news for me is that the May graduation quilt is not only back from the quilter but the binding done as well. The May birthday quilt is at the quilter. The September Christmas / Wedding quilt top (I can’t get used to calling them “flimsy”) is half done. Congratulations on the goat family we don’t have goats now, so I am so happy to see your kid photos–our sheep are late lambers–so no lambs yet, but the cows are doing fine, and Mr. Wonderful feeds by the house so we can watch them easily and get a good count. I did 350 blocks in March making year-to-date of 1159. I also got five ufos finished. Your kids are soooooo cute!!! 46 for me this month. I finished all the blocks for my UFO guild challenge and got the top set together, and got my rainbow scrap chicken quilt top set together, and did several of the filler block sections on my Summertime Sampler quilt as well as several more for my Bonnie Hunter leader/ender quilt in between the other stuff. The baby goats are so fun. We have our first kittens of the season here. I created 32 blocks for 3 different projects this month. I finally got all the blocks created for one quilt, now I just need to find a space big enough to lay it out to figure out block order. I need to keep sewing as my list of projects keeps growing. On the critter front I have a baby calf and a few more “wonder” cows… wonder when they’ll calve. I’m hoping the mud dries a bit so I can get my broccoli and cabbage plants in the ground before the cat tries to eat them! We weren’t as productive this month. In our defense, we were on the road for two weeks and have been sick since getting home. 17 for me and 6 for Jason. Love those improv blocks and the baby goats!! My count is 105 for March along with a trip to Florida. Got 90 blocks out of my scraps. I really want to make a difference in my scraps this year. I did a few more blocks on my granddaughter’s quilt. Need to cut out some more pieces. Once I get blocks made want to see on my husband’s grandma’s machine. My husband has even ask if he could do a stitch or two. 24 blocks completed in March. Today I finished the quilt top I started the beginning of the month. I don’t truly know how to count it all, so I’m going to say 30 which includes 3 borders. My first time following a written pattern, and I reworked it to be just a fourth of the pattern. Used fabric from another pattern I didn’t care as much for, and had to pull from my stash whatever else was needed. I was also challenged to learn how to add a mitered wide border. Because I got in a hurry, I didn’t include the seam allowances width when I cut this border, the quilt will finish less than 60″ x60″, but I’m still happy. Will need to piece the backing a little, but have a great idea for next month. I forgot to add the front and back of the pillow (2 blocks) that I made for my grandson’s birthday. Guess that will bring my total for March to 32 blocks. 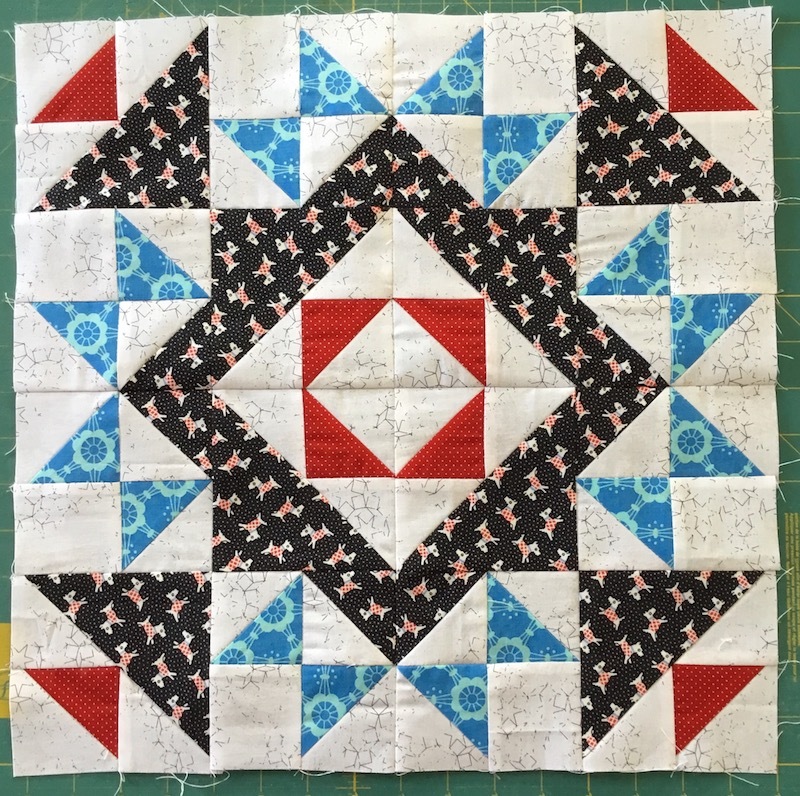 I made 75 blocks…all red, white, and blue for Quilts of Valor. 56 blocks raced through my machine in March. I have retreat the end of the month so hope to have even more this month. Charity Quilts and Quilts of Valor are on tap for this month. This was vacation month for me. We were gone for two weeks and while I was gone my machine was in for service. I have picked up that machine and taken my quilting machine in for service now. I made no blocks this month but I needed a rest after the two wedding quilts finished in February. I finished 36 blocks for the month. I made 9 cat mats for our local shelter and 12 Mug Rugs. I am leaving in 6 days to see son and family (who I haven’t seen for a long while) and made 6 of the 12 mug rugs for them. Since I will be gone 9 days I expect less blocks accomplished this month. 25 blocks for this month. Lucky I made that many!! Was finishing a lot of small projects. Then, so exciting! !, found I could get a ruler foot that would fit my domestic machine. My LQS ordered it and rulers package starter kit. While waiting for it to arrive, I made a cute, quick, simple top as they are giving me free lessons to make sure it fits and tips for using it/rulers. Any excuse for a new top, right!!?? 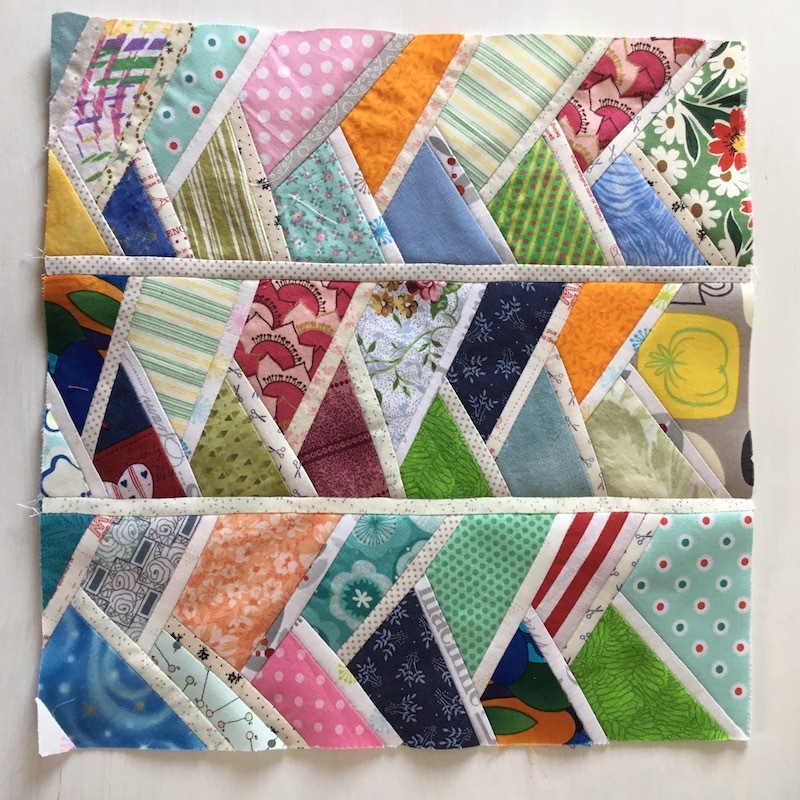 If you are looking for an adorable pattern perfect for scraps (1.5″ x 7.5″ and 5″ x 7.5″) get City Lights free at AllPeopleQuilt.com. 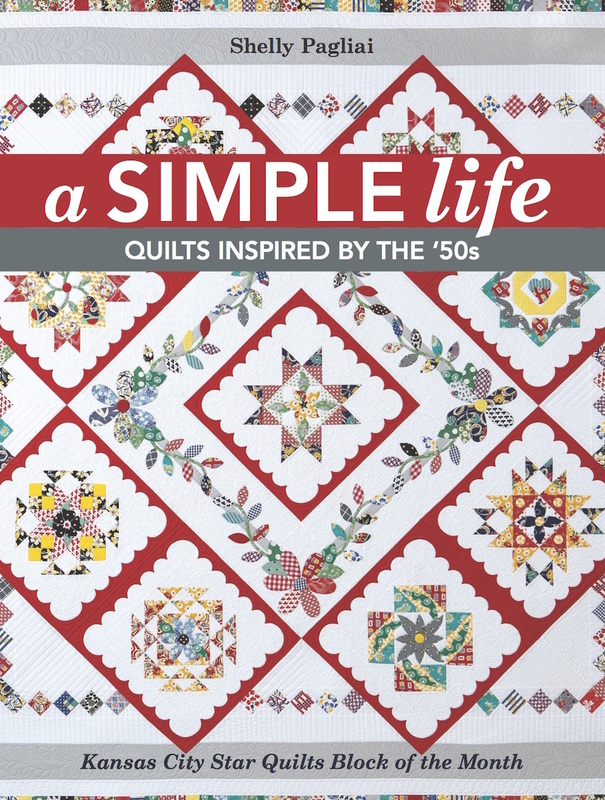 I don’t “do” scrappy quilts, but I can see where this would be one I could. I used a collection of hippy-inspired prints I had on hand. I liked it so much, I pulled out two fat quarter bundles of grey/black/white/silver I had and added some more from my stash for another one. Are you like me? Can’t resist collection patterns and going shopping in my stash when I find one that sparks my creative light? Just 39 blocks for me–I’m actually surprised I finished that many since I started a new job that has seriously cut into my sewing time! Your new babies are so cute! 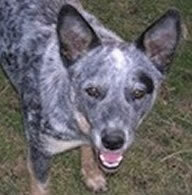 Love seeing pictures of your 4 legged babies. I had another good month, for me. I did 2 blocks for Stash Bee, 2 blocks for Block Lotto, 20 more crumb blocks. So that is a total of 24 blocks. Your goat babies are adorable! 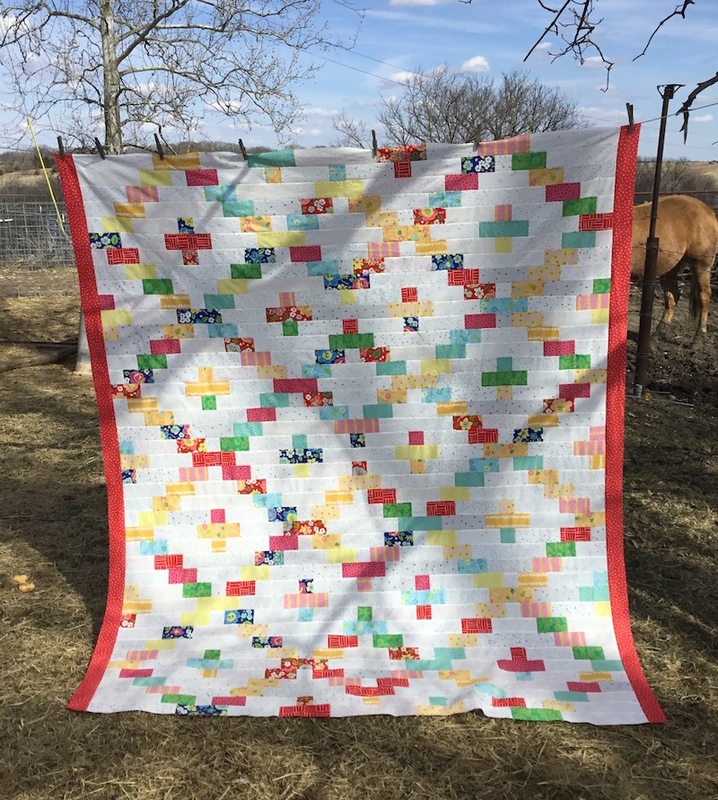 We just had our first camping trip of the season this past weekend so I have to make sure that I do a lot of block piecing during the week since our weekends will be getting extremely busy as the weather gets warmer. What sweet little baby goats! I love all your blocks too. You just answered my question on how to count the blocks for Virginia’s puzzle, that gives me two more blocks for March. My total is 47….as I keep saying, I’m trying to exceed the goal each month so I don’t fall short at year’s end. I started writing my blocks in a notebook and it took me 15 minutes to find the book this morning! All my blocks were made the first of the month and then I got sick with the flu and haven’t done anything for 2 weeks. I got 4 baby quilts, 4 thunderstruck (put them together for one big quilt) 2 from quild and 2 for your block of the month. 196 blocks. I think I forgot to turn in last months….oh well! I completed 81 pieces blocks for a block exchange (I still need to finish the remaining 81 blocks for this exchange) and also one applique block in March. Thank you for pulling my name for the month. It was a pleasant surprise, Shelly. Reading through the comments I’m amazed at the number of blocks that can be completed in a month. 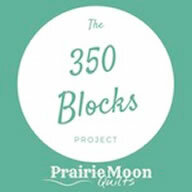 35 blocks is my output for March. The distraction from quilting time was preparing for the vegetable garden and then, planting broccoli, romaine and a few herbs. I had 68 blocks this month plus some “test” blocks that I don’t count. I also got one project quilted, now for binding. I’ve been cutting a lot, for scraps and for future projects. It’s always something. I got 29 done this month. Love seeing all your farm animals. And I’m having fun picking out my fabrics and getting started on the Virginia’s Puzzle quilt. Thank you for all you do for us! Loved your goat blog earlier. They are so cute! Even with a little tripping (machine went along) and canning some sauerkraut I managed 70 blocks this month. Probably a good thing since I need to get these blocks into tops and work on blocks sent to me for Linus. This will give me a little breathing room!!! I made 138 blocks during March. 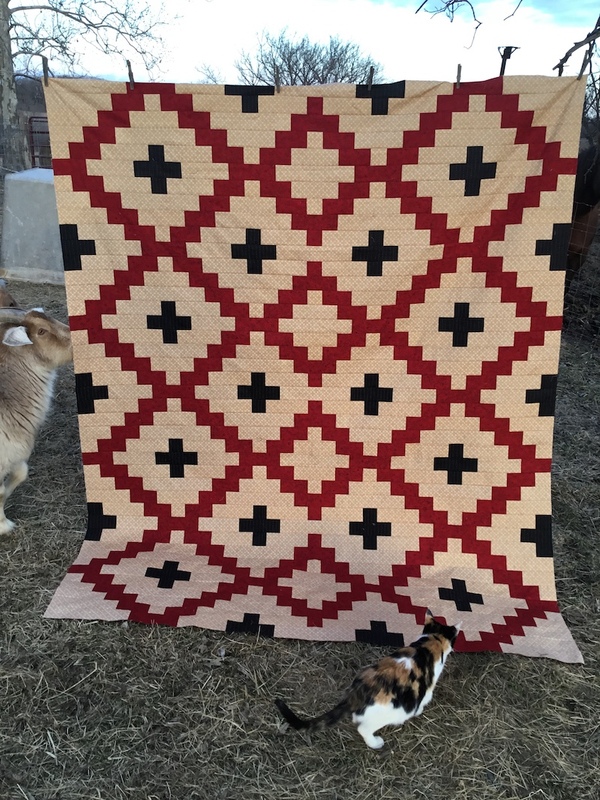 The quilts you’ve made are just great, and the baby goats are too cute! Nice work getting 90 blocks done. I managed to complete 34 blocks for me. I completed 14 feather blocks for a large quilt and 2 elephant blocks for a baby quilt that I’m making up as I go along. The baby goats sure are cute! I only made 30 blocks this month……..but three of them were awfully complex!!!!! Took me days to do them. Not complaining however. I am concentrating on UFO reduction. 92 blocks for me in March. 85 of them were part of a hard push towards a deadline. Nothing like a deadline to encourage inspiration! 160 for the year. YAY! All of the pretty work that you have finished! Amazing. Yes, it’s hard to believe that it already April. How time flies… I was able to sew 30 blocks in March. Hoping for more in April. I made 135. 52 of them were the improv trees, and they are so, so fast. 20 blocks this month. If I can just keep increasing every month I might make it! 80 this month, 41 in Feb which did not post. Having trouble getting my comments to go through. Even my e mail was rejected for spamming. I feel like I have been gone forever. I was suppose to come home on March5th, but was having such a wonderful time I stayed a couple of extra weeks. I made 64 blocks in March. I am very pleased. I think having a goal in mind keeps me going. Thanks! March total is 8…finishing tops and setting together with sashing and borders. Quilting is next, one down and two to go – fortunately not large quilts! I completed 70 quilt blocks this month. I even finished a couple of UFOs. Yeah! I really like the Virginia’s Puzzle pattern. My mom’s name was Virginia, so I think I will have to make this pattern. Thanks. I got 32 blocks done. Lot of cleaning and tossing out stuff this month. You got a lot done last month! The baby goats are so cute! I made 53 blocks in March. Wow what great blocks and sewing!! I’m late to report my blocks and haven’t managed a count yet…maybe my March tally will have to go with April’s one? Been busy quilting with longarm and hand work this month, but did get 20 blocks done.